The big talking point surrounding Dortmund vs Hamburg was Marco Reus’ return to match duty. The forward played the first 70 minutes as Dortmund collected another three points in their resurgence up the table. Marco Reus returns for the Yellow and Blacks. Michy Batshuayi scored his third goal in his second game. Mario Götze and André Schürrle bring back memories of the World Cup when they combined for the second goal. The biggest surprise came ahead of the match with Marco Reus not only being declared match fit but also slotting straight into the starting eleven for Borussia Dortmund. The captain then was one of the most active players in what was a chaotic start to the match. Lacking structure both teams pressed high and forced plenty of turnovers without creating too many clear-cut chances in the early goings of the first half. Reus, in particular, was often active in creating attacking movements in Dortmund’s half once the Yellow and Blacks reached Hamburg’s penalty box. However, they would often play too complicated with one pass too many rather than setting in scene powerful striker Michy Batshuayi. Hamburg, in fact, did well to not only disrupt Dortmund’s attacking game but also swarm forward themselves on occasions and as a result, had the more dangerous moments of the game in the first half. Between the 35 and 38th minute, Hamburg encircled Dortmund in their penalty box, and BVB defenders Ömer Toprak and Manuel Akanji had to work hard to undermine Hamburg’s attacking moves with Akanji, in particular, doing well to dive into a Filip Kostić shot in the 38th minute that appeared destined for goal. Dortmund in the meantime had their most dangerous moment just before the halftime tea with Shinji Kagawa placing a shot in the arms of HSV goalkeeper Christian Mathenia. At that point, a Dortmund lead would have been undeserved anyhow as Hamburg were the better team in the first half. Within moments of the second half, Borussia Dortmund took the lead. Christian Pulisic receiving a great ball from Reus on the right corner of the penalty box played a sharp pass across the goal mouth that found Batshuayi and the Belgian striker made no mistake to score his third goal in his second game for BVB. The lead at that point might not have been deserved, Hamburg displayed a more committed work rate up to that point outrunning Dortmund by 5km. 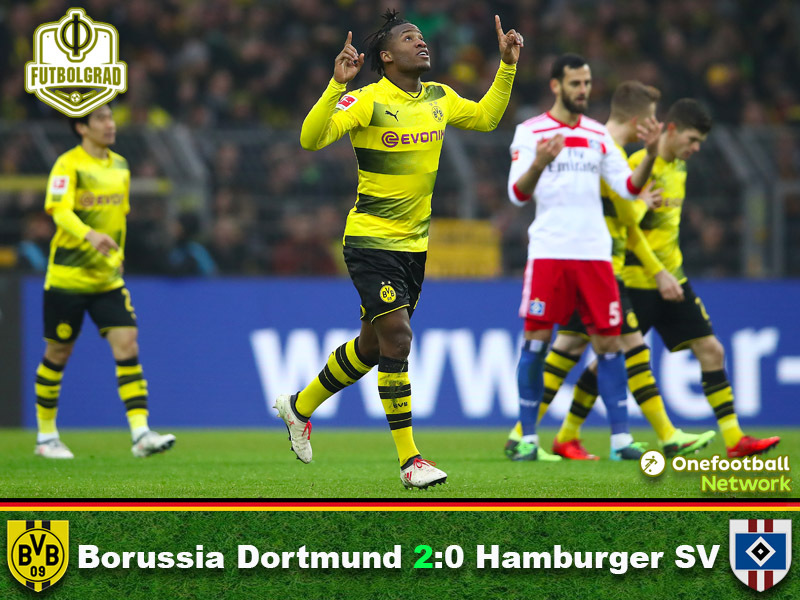 But the goal helped Dortmund to settle the game a bit more as the Yellow and Blacks were now able to absorb the pressure more effectively hoping to benefit from a Hamburg slipup to wrap the game up. That moment almost arrived in the 62nd minute when Reus won the ball deep in Hamburg’s half storming forward he found André Schürrle unmarked on the left and the forward broke into the box attempting to beat Mathenia with a curling effort. 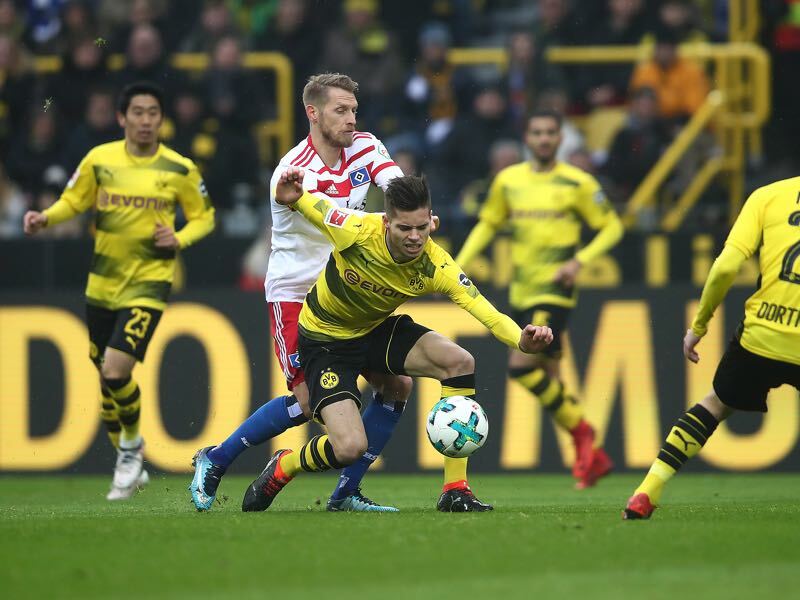 The HSV keeper could not control the ball, and Mahmoud Dahoud brought the ball back in front of the goal where Pulisic missed the empty net. In the 71st minute, Marco Reus’ day was over. Peter Stöger took the attacking midfielder off and brought on Mario Götze. The move was likely supposed to inspire more structure in Dortmund’s game. Despite being a goal down Hamburg continued to disturb Dortmund’s buildup play effectively. In truth Dortmund’s game up to this point was poor. The Yellow and Blacks lacked proper structure in the buildup play and their Gegenpressing, although aggressive, lacked direction. When Dortmund did manage to break through, like in the 75th when Dahoud managed to play inside the box to Pulisic, Dortmund lacked efficiency to finish goal-scoring situations. Hamburg in the meantime kept pressing till the very end without creating a clear-cut goalscoring opportunity and although they seemingly dominated the game highlighted why der HSV are currently in relegation trouble. It was, therefore no surprise that although Hamburg were the better side, it would be Dortmund to score the final goal of the game with Schürrle and Götze bringing back memories of the 2014 World Cup final when Schürrle found Götze in the box, and the midfielder made no mistake chipping Mathenia to score a beautiful goal. It was a poor game without any player looking particularly good in what was a cold and wet night in Dortmund. In the end, the man of the match award goes to Michy Batshuayi, who scored the game-winning goal of the match. The Belgian forward therefore continues his strong start to his Bundesliga career and has now scored three goals in his first two games for Dortmund. Marco Reus returned for Dortmund after sustaining an ACL injury in the DFB Pokal final in May. The attacking midfielder was an active point in all of Dortmund’s attacks in the first half. But at the same time, it was obvious that Reus still needs time to get up to match fitness as his timing for passes and runs seemed a bit off at times. Lukasz Piszczek played his 284th competitive match for BVB today, drawing level with Stephane Chapuisat. Only one foreign footballer played more often for Dortmund: Dede (398 times). 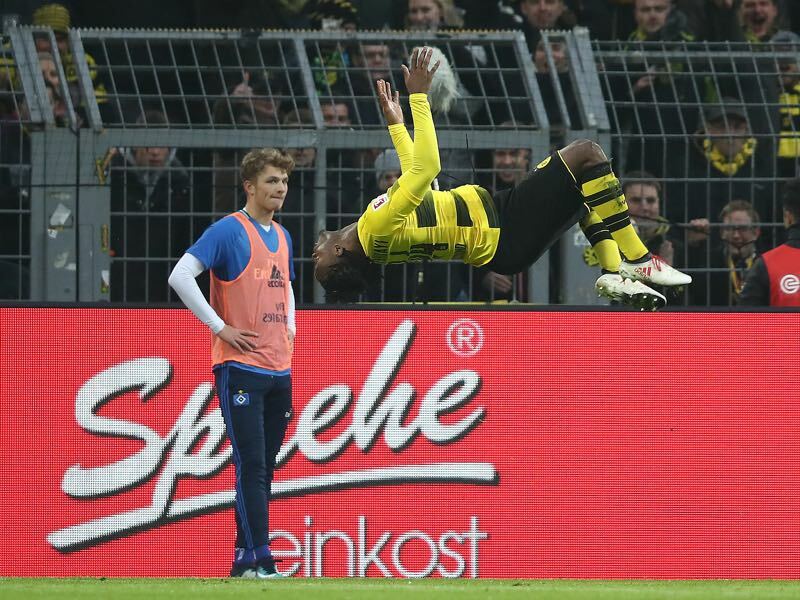 Batshuayi scored his third goal in his second game for Borussia Dortmund. Schürrle set up a goal for Götze for the first time since the 2014 FIFA World Cup final where Götze scored the golden goal for Germany.